Note: Vino Rosso broke his maiden in his first start at Aqueduct then shipped to Tampa Bay Downs to win an allowance. He maid his 2018 debut finishing 3rd in the Sam F. Davis Stakes (G3) then 4th in the Tampa Bay Derby (G2) before shipping back to Aqueduct to win the Wood Memorial (G1). In the Kentucky Derby (G1) he trailed early then passed tired horses to finish 9th beaten 10 1/2 lengths at odds of 14-1. In the Belmont Stakes (G1) he sat 7th early then rallied to get 4th beaten 3 3/4 lengths at odds of 15-2. Justify just great in the Belmont Stakes (G1) - Justify went to the front and never looked back, winning the 150th Belmont Stakes (G1) by 1 3/4 lengths to become the 13th Triple Crown winner. Late closing Gronkowski finished second with Hofburg third. Get the results, charts, and photos here. Belmont Undercard Stakes Results - There were nine other stakes on the 2018 Belmont undercard, including the Manhattan Handicap (G1), Just a Game Stakes (G1), Metropolitan Handicap (G1), Acorn Stakes (G1), and Ogden Phipps Stakes (G1) won by Spring Quality, A Raving Beauty, Bee Jersey, Monomoy Girl, and Abel Tasman. Get the results, charts, and photos for all nine here. 2018 Belmont Festival Friday Stakes Results - Friday at Belmont Park had 5 stakes races: the True North (G2) won by Imperial Hint, the New York Stakes (G2) won by Fourstar Crook, the Belmont Gold Cup Invitational (G2) won by Call to Mind, the Bed o'Roses Invitational (G3) won by Lewis Bay, and the Tremont Stakes won by Our Braintrust. Get the results, charts, and photos here. 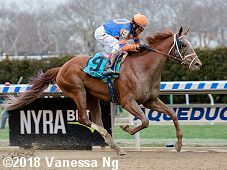 Intercontinental (G3), Wonder Again (G3), and Astoria Stakes - The Belmont Stakes Festival kicked off on Thursday with three stakes races, the Intercontinental (G3) won by La Sardane, the Wonder Again Stakes (G3) won by La Signare, and the Astoria Stakes won by Athens Queen. Get the results, charts, and photos here. Thursday Morning Belmont Stakes Photos - Thursday morning at Belmont Park, all 10 of the Belmont Stakes horses, including Triple Crown hopeful Justify, were out on the track. Lots of photos from the day including bonus horses Hoppertunity and Abel Tasman. Wednesday Belmont Stakes Photos - Wednesday at Belmont Park, Triple Crown hopeful Justify arrived along with stablemate Restoring Hope to join the rest of the field already there. Lots of photos from the day including Hofburg and Gronkowski on the track in the morning. 2018 Belmont Contenders at Churchill Downs - Monday at Churchill Downs, Justify had his final timed work before the Belmont breezing 5 furlongs in 1:01.40. Lots of photos from this morning of Justify and crew, plus Tenfold and Restoring Hope. 2018 Belmont Contenders at Churchill Downs - Photos and comments for Justify, Bravazo, Free Drop Billy, and Restoring Hope plus Oaks winner Monomoy Girl from Sunday at Churchill Downs. Both Free Drop Billy and Monomoy Girl had timed works. 2018 Belmont Contenders at Churchill Downs - Photos and comments for Justify, Bravazo, Tenfold, Free Drop Billy, and Restoring Hope from Friday and Saturday at Churchill Downs as they prepare for the Belmont Stakes. Justify wins the Preakness (G1) - Favorite Justify led all the way in the fog and slop to win the 2018 Preakness (G1) by a 1/2 length over Bravazo and a late closing Tenfold another neck back. He will go on to the Belmont undefeated. Get the results, chart, and photos here. Preakness Undercard Stakes Results - There were 7 other stakes on Preakness day but because of the rain only one of the turf races, the Gallorette (G3) won by Ultra Brat, stayed on the grass. The Dixie Stakes (G3) was won by Fire Away on the dirt and the Maryland Sprint Stakes (G3) won by Switzerland. Get the results, charts, and photos for all 7 races here. Black-Eyed Susan Day Results - Red Ruby splashed home by 4 3/4 lenghts to win the 2018 Black-Eyed Susan Stakes (G2) at Pimlico in the slop on Friday. There were 6 other stakes on the card including the Pimlico Special (G3) won by Irish War Cry, the Allaire Dupont Distaff (G3) won by Song of Spring, and the Miss Preakness Stakes (G3) won by Happy Like a Fool. Get the results, charts, and photos for all 7 races here. 2018 Alibi Breakfast - The traditional Alibi Breakfast was held on Thursday May 17, before the 143rd running of the Preakness Stakes. Connections of some of the 8 Preakness entrants were on hand to swap stories about their horse as well as watch the presentation of the annual awards. Thursday Preakness Photos - Photos and comments for 7 of the 8 Preakness horses from a rainy Thursday morning at Pimlico, where the rain only stopped for Justify to go out and poor Good Magic got dumped on. 2018 Preakness Entries - It will be only a field of 8 to challenge Justify in the Preakness on Saturday. Check out all the horses entered and links to full profiles of each horse with photos. Justify drew post 7 and is the 1-2 morning line favorite. Wednesday Preakness Photos - Photos and comments for 7 of the 8 Preakness horses from Wednesday afternoon at Pimlico, including Good Magic, Bravazo, and Sporting Chance on the track plus the arrival of Justify, Quip, Lone Sailor, and Diamond King. Tuesday Preakness Photos - Photos and comments for four of the Preakness horses from Tuesday afternoon at Pimlico, including Good Magic, Bravazo, Sporting Chance, and Tenfold who arrived at the track today plus bonus pic of the Budweiser Clydesdales. Tuesday Preakness Photos - Photos and comments for four of the Preakness horses from Tuesday afternoon at Pimlico, including Good Magic, Bravazo, Sporting Chance, and Tenfold who arrived at the track today plus bonus pics of the Budweiser Clydesdales. Analyzing the top Preakness Contenders - Our annual analysis of the contenders to see who best matches the profile of a Preakness winner. The top pick is no surprise this year, even if it isn't Justify. Justify splashes to the finish in the Kentucky Derby (G1) - Favorite Justify pressed the pace the whole way before winning the Kentucky Derby (G1) by 2 1/2 lengths in the slop over Good Magic with late closing Audible third. Get the results, chart, and photos here. Kentucky Derby Undercard Stakes Results - There were 6 other stakes on the card today with the Derby, including the Old Forester Turf Classic (G1) won by Yoshida, the Humana Distaff (G1) won by American Gal, the Churchill Distaff Turf Mile (G2) won by Proctor's Ledge, the Churchill Downs Stakes (G2) won by Limousine Liberal, the American Turf (G2) won by Maraud, and the Pat Day Mile (G3) won by Funny Duck. Get the results, charts, and photos here. Monomoy Girl takes the Kentucky Oaks (G1) - Monomoy Girl survived an objection from John Velazquez aboard second place finisher Wonder Gadot to win the 2018 Kentucky Oaks by 1/2 a length with favorite Midnight Bisou third. Get the results, chart, and photos here. Kentucky Oaks Undercard Stakes Results - There were 5 other stakes on the card today with the Oaks, including the La Troienne (G1) won by Salty, the Alysheba (G2) won by Backyard Heaven, the Eight Belles (G2) won by Mia Mischief, the Twin Spires Turf Sprint (G3) won by Will Call, and the Edgewood Stakes (G3) won by Toinette. Get the results, charts, and photos here. Thursday Kentucky Derby Photos - 19 Derby horses and 9 Oaks fillies from Thursday morning. Wednesday Kentucky Derby Photos - 19 Derby horses and 11 Oaks fillies from Wednesday plus some scenic shots. Tuesday Kentucky Derby Photos - 17 Derby horses and 10 Oaks fillies from Tuesday plus some scenic shots. Kentucky Derby Entries - A field of 20 plus one also-eligible was entered for the 144th Kentucky Derby on Tuesday morning at Churchill Downs. Favorite Justify drew post 7 with morning line odds are 3-1. Get lots of info and links to full profiles of each horse with photos. 2018 Kentucky Derby Analysis - Our annual analysis of the top contenders to try and select a winner by matching each to the profile of a Kentucky Derby winner using many of the more popular angles and statistical trends. The top horse will surprise you, but the bottom horse will surprise you even more! 2018 Kentucky Oaks Entries - A full field of 14 three-year-old fillies were entered for the 144th Longines Kentucky Oaks to be run at Churchill Downs on Friday afternoon. Rachel Alexandra (G2) and Ashland (G1) winner Monomoy Girl is the 2-1 morning line favorite but drew the far outside post. Review: Triple Crown Handicapper 2018 - by Jim Mazur. Includes lots of stats for all 3 races and explains how to use a system of statistically derived negative angles to eliminate the "bad" picks. Revamped for 2018 with updated info. Triple Crown Trail - 2018 prep race schedule with results for all the preps. 2018 Kentucky Derby Security and Parking - After the new remodel, entry and parking are very different this year. Get details about that plus what you can and cannot bring to Churchill Downs on Kentucky Derby day. Prohibited items will be confiscated and disposed of, so be careful!